The new Ford Galaxy Estate looks more stylish than last time around and can boast more interior space. It’s reasonably priced and suits modern families who want something that’s bigger and more versatile, than a hatchback. If the size of a car is important to you, the Galaxy’s immense dimensions will be appealing. It uses its size well and although it might be a bit cumbersome to drive, it’s easily one of the most practical cars on the road right now. It can fit seven people and feels built to cope with the demands of a full load. 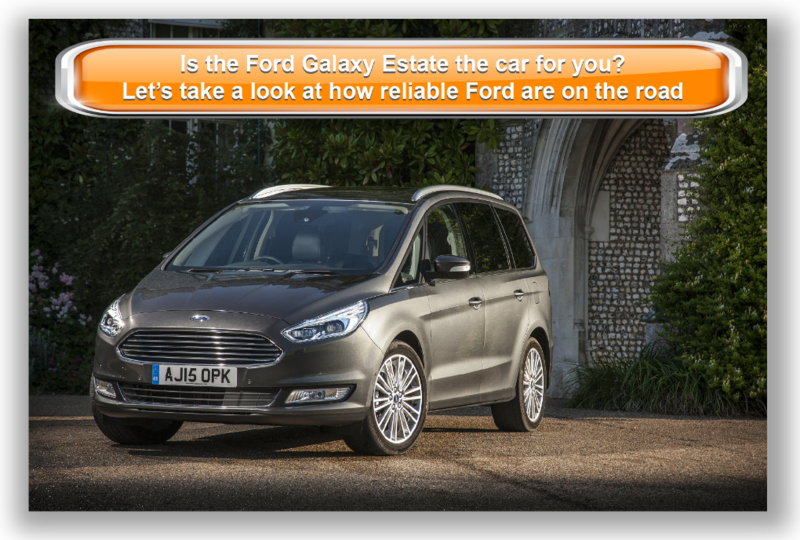 OSV takes a closer look at what it’s all about with our Ford Galaxy review. For such a large car, the Galaxy Estate is good to drive. But what’s more important to buyers is that it’s a high performer. Fortunately, it is. The Galaxy is also refined, comfortable and manages to stay almost whisper-quiet when you’re out and about in the town. Even on the motorway it doesn’t make too much of a noise and therefore makes for a very pleasant driving experience. In fact, it’s arguably Ford’s best large car to drive and comes with the positive handling attributes that we associate with a number of Ford models, including the Mondeo and the Focus. Thanks to nicely judged suspension, it’s also comfortable most of the time. Crash over bigger potholes though and you will feel it. A good amount of grip is assured if you opt to add four-wheel drive, while the steering is well weighted. Out of the diesels engines, the 2.0-litre 148bhp TDCi promises to be the bestseller. It can do 0-62mph in 10.9 seconds, but a 178bhp variant offers, even more, power and pace and can get you from a rest to 62mph in 9.8 seconds. There is also the option of an even beefier 207bhp model that does the 0-62mph dash in 8.9 seconds and is characterised by liberal revs and solid refinement. All models are paired with a manual gearbox as standard, but some can be combined with an automatic transmission for an extra £1,500. There are also two engines available – a 1.5-litre 158bhp and a 2.0-litre 237bhp EcoBoost turbocharged unit. However, they don’t suit the Galaxy’s character as well as the diesels. The cabin has never looked this good and has a real upmarket feel about it in 2016. It’s classy and well put-together. 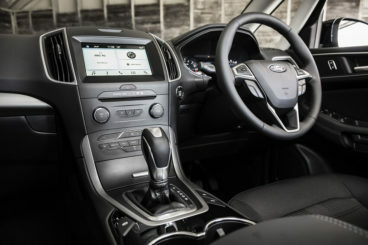 It’s also comfortable and luxurious, with Ford splashing out on better quality materials than last time around. These include soft leather seats and chunky aluminium trim. Look hard enough and you will spot some cheaper plastic here and there, but everything is robust and built to last. The dash is clean and modern-looking and a highlight is the new 8” high-res central touchscreen that replaces many of the buttons from the previous model. You can also add a digital display for a bit more cash and it is well worth it. You use the multifunction steering wheel to control it and not only does it make your life a bit easier, it also adds to the overall contemporary ambience of the cabin. The Galaxy is more practical than the S-MAX, so although it costs more and doesn’t look as good as its stablemate, it can offer you more versatility, including the ability to seat seven people. And when we say seven people, we mean seven adults. Usually, a third row of seats is strictly for kids, but that isn’t so here. Two adults can sit right in the back in comfort, while big windows make sure that nobody feels hemmed in. However, the third row does have to make do without a USB port. 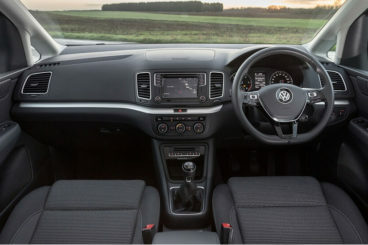 For more legroom, you can slide the second row of seats backwards and forwards, while other touches that enhance this cars practicality include cup holders up and down the cabin, a deep storage bin at the front and a trip of ISOFIX mounting points for the second row. If you need to keep all seven seats in place, the boot measures 300-litres. Fold the third row down and you can increase this to 1,301. Fold the second row of seats down too and you can extend boot capacity to a whopping 2,339-litres. It’s enormous and what’s even better is that the loading lip is low. The entry-level model is well equipped and gets sports seats, rear and front parking sensors, 17” alloys, a DAB digital radio and power-folding door mirrors. The Titanium model adds tinted windows, automatic wipers, cruise control and LED daytime running lights. If you fancy the plusher Titanium X range, you also get leather upholstery, a quality panoramic sunroof and heated seats. Optional extras include satellite navigation and the panoramic sunroof for the base level model. Prices for the new car start out from £27,000 and rise to over £37,000. If you want to lease it, you can pick up a deal from as little as £285+VAT per month. In terms of running costs, the car doesn’t fare too badly but it’s recommended that you go for a diesel option. The 148bhp and 178bhp return the same numbers and are both able to return fuel economy of 52.3mpg while costing £130 a year in road tax. A 2.0-litre 207bhp twin-turbo diesel is more powerful, but is still good for 51.4mpg, while incurring a yearly road tax bill of £145. The 1.5-litre 158bhp petrol engine is less economical and can only average returns of 43.5mpg, while emitting 149g/km of CO2. The bigger 2.0-litre EcoBoost petrol unit, meanwhile, can only return 35.8mpg, and costs £230 a year in road tax. The Galaxy is not as fun to drive as the last one, but the shift away from entertainment and towards comfort this time around is hardly a controversial one, as it’s arguably what many families want from such a large, practical car. The new platform ensures a much softer ride. It’s so big, you could get lost. There are a number of seven seat models on the market, but few can sit seven adults in comfort. Most come with a third row of seats designed specifically for kids, but not the 2016 Ford Galaxy Estate. Looks never used to be a deal breaker in this sector, mainly because nothing looked good. Nowadays, though, it’s important to look the part. Although the new Galaxy is more stylish than last time around, it still can’t compete with slicker-looking rivals. The Galaxy’s preference for comfort over fun is symptomatic of the Ford range in general. Both the new Mondeo and Focus models aren’t as much fun to drive either, and you definitely won’t be grinning to yourself as you lurch this hefty machine around bends. 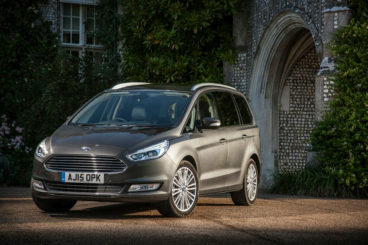 Let’s see how the car measures up against its rivals in the comparison section of our Ford Galaxy Estate review. 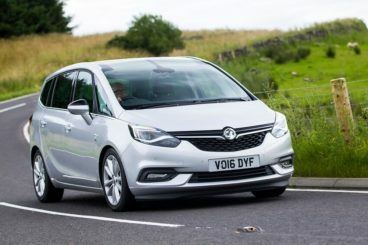 The new Vauxhall Zafira Tourer is practical and smart and like the Galaxy it can fit seven people – but only at a push. The Zafira isn’t what you’d call fun to drive, but handling isn’t bad. Moreover, the suspension is set up in such a way to offer a comfortable ride, while there is a good selection of engines which should mean there is something for everyone. Overall, it feels safe and predictable on the road, which should suit families well. There is plenty of grip and not too much body lean. A turbocharged 1.4-litre petrol engine kicks things off. It’s got a good amount of power and feels sprightly enough and can do 0-62mph in 9.9 seconds. Previously, there was also a 1.8-litre petrol engine on offer, but Vauxhall has seen reason to drop it from the ranks, presumably because it wasn’t especially efficient or powerful. The diesel engines suit the car’s character better. A smooth and strong 1.6-litre diesel unit can do 0-62mpg in 11.2 seconds, which sounds slow but once you get it up and running it provides plenty of power to haul the car along without much hassle. The 2.0-litre diesel is a better option if you’ll regularly be travelling with a full load though. The 1.6-litre diesel engine is the cheapest to run and can average fuel economy returns of 62.8mpg while incurring an annual road tax bill of £30. The 2.0-litre diesel is also economical and can achieve returns of 57.7mpg. The cabin looks a lot better than last time. It’s more spacious, more comfortable and the controls are easier to operate. The steering wheel and driver’s seat are adjustable, while a neat new 7” infotainment touchscreen comes as standard on all models. The Zafira was the first car to introduce individually flat-folding seats, and today it’s still able to collapse its rear seats in just a few seconds. This is one of its biggest selling points. However, while the Galaxy can accommodate seven adults, the third row of seats in the Zafira are really only for kids. The boot, meanwhile, measures 710-litres. The new Volkswagen Sharan Estate is a seven-seat estate that is practical and sensible, but which can seem a bit costly compared to its rivals. Despite its large size, the Sharan Estate is actually pretty good to drive. This is down to the fact that it shares its underpinnings with a number of other cars in VW’s range. As such, it’s lighter than the Galaxy and also agiler. A trio of diesel engines fill up most of the range. They’re all 2.0-litre units but in separate power guises. The mid-range 148bhp variant is our top pick; it’s performative and strong, but also pleasingly efficient and economical. It can do 0-62mph in 10.3 seconds, before maxing out at 124mph. If you want a bit more pace, the 181bhp variant does the same distance in 8.9 seconds. There is only one petrol engine available – a 1.4-litre TSI that delivers up to 148bhp. It suits the car well, and is worth a closer look, especially if your annual mileage is going to be low. It can average fuel economy returns of 43.5mpg, which isn’t half bad for a car this size. The diesels are more efficient, though and both the entry-level and mid-range diesel can return 56.6mpg, while incurring an annual road tax bill of £110. The 181bhp has enough power to tow a caravan and achieves returns of 53.3mpg while costing £130 a year in tax. Inside, the Sharan is by no means the slickest looking thing, but it is quiet and comfortable. The design is straightforward and simple, though a little on the dull side. However, it’s clearly built to last and should be able to cope manfully with the rigours of family life. This is also a super practical car that can boast plenty of space and storage areas. 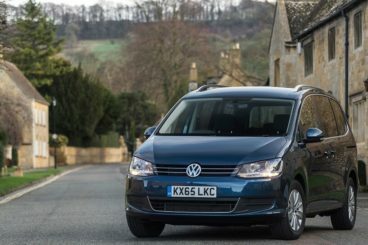 Head and legroom is good all around, but to get the best out of the 2016 Volkswagen Sharan, we recommend going for the six-seater instead of the seven. As seven-seaters go, the Galaxy is better. Intelligent storage solutions are everywhere and include a pair of coat hooks, a pair of cup holders and footwell storage, while the boot measures 375-litres with all seven seats in place. The third row of seats is collapsible for extra storage. This is Ford’s biggest family car. Capable of accommodating seven adults, it’s super practical. It isn’t as fun to drive as last time, but that doesn’t mean it’s woeful. In fact, it still offers a pleasant driving experience that is hassle-free. “Hassle free” actually defines this large car, and if you need to make it even more versatile, you just need to tick the right boxes on the optional extras list. 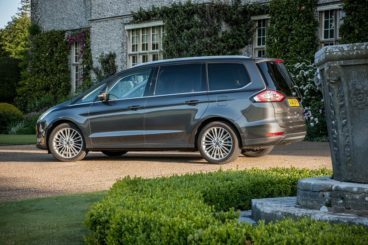 Comfortable, safe and useful, the new Ford Galaxy Estate is a massive star.